Szymon Nehring is the Gold Medalist at the latest Arthur Rubinstein International Piano Master Competition, 2017, and claimed the prize for Best Performance of a Chopin Piece. At the 17th International Fryderyk Chopin Piano Competition, he was Audience Favorite and received Honorable Mention. In 2016 he released two albums: Chopin’s Piano Concertos and Krzysztof Penderecki’s Piano Concerto “Resurrection”, conducted by the composer. He recently recorded Chopin’s works on a period instrument. Nehring has appeared in Europe, Israel, North and South America. 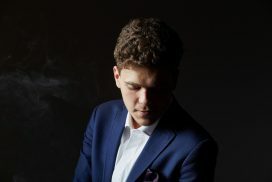 He recently toured Japan and China as part of a Rubinstein Winners Tour and made his debut recital at Carnegie Hall, New York. Future plans include performances at Chopin Festivals and at the Ludwig van Beethoven Easter Festival in Warsaw, concerts with the Israel Philharmonic and at the Elbphilharmonie Hall (Hamburg). In autumn 2017 Szymon has begun his studies with Prof. Boris Berman at Yale School of Music. Former teachers include Stefan Wojtas (Academy of Music, Bydgoszcz) and Olga Łazarska (F. Chopin’s School of Music in Kraków). Szymon Nehring is represented by the Ludwig van Beethoven Association.